Eight, (www.eightsleep.com) the technology company focused on improving the way we sleep — today announced the launch of a smart mattress, designed to replace traditional mattresses with an alternative that helps customers get better sleep through higher comfort and technology. The Eight Smart Mattress is designed with four layers of responsive and high density foam, plus a technology layer that tracks sleep, warms each side of the bed individually, and connects to other smart home devices. It is available for purchase online today starting at $950. Eight's team designed the smart mattress by studying over 1.8 million hours of sleep data that have been tracked through the company's first product — the Eight Sleep Tracker— which by the end of the year will be tracking more than 12,000 people across 67 countries. "We used anonymized sleep data and the feedback of over 10,000 people, to understand which materials and types of mattresses give customers the best sleep," said Matteo Franceschetti, CEO at Eight. "Based on our research, we saw an opportunity to create a better mattress. So we designed one with a unique blend of four responsive and high density foam layers that provide optimal comfort and support, plus one layer of our proprietary technology that helps people track and improve their sleep." The Eight Smart Mattress includes features that improve the sleep experience, like automatic temperature control for each side of the bed, and connectivity with other smart home devices like thermostats, lights and coffee machines. The mattress contains multiple sensors to track sleep times, deep and light sleep, breathing rate, and measure toss and turns, bed temperature, and room temperature. Over time, the Eight Smart Mattress uses machine learning to build patterns on sleep behaviors, and displays suggestions for sleep improvement in its mobile app. It can also share this data with health tracking apps like Apple's Health and Google's Fit. The Eight Smart Mattress comes in Full, Queen, King and California King sizes, and is available for order beginning today, offering a 100-night trial and free returns. 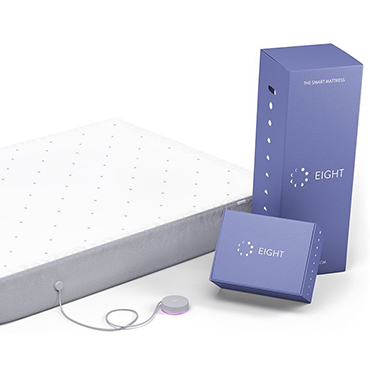 It ships compressed in a box, and at no cost to customers in the U.S. Visit eightsleep.com to learn about other features of the Eight Smart Mattress.